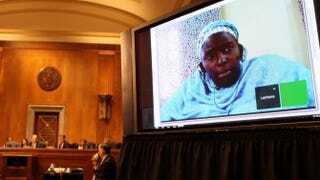 Lantana Abdullahi testifies before the U.S. Senate Committee on Foreign Relations Subcommittee on African Affairs May 15, 2014, in Washington, D.C.
Over the last two days, Boko Haram, the group claiming responsibility for the abduction of more than 200 Nigerian schoolgirls several weeks ago, has been blamed for several attacks on villages near Chibok, where they were kidnapped. On Tuesday, the BBC reports, 118 people were killed in a bombing in the town of Jos, and on Wednesday, Al-Jazeera reports, the rebel group carried out bombings in three separate towns and burned the Alagarno village to the ground. These reported atrocities, which have become commonplace in the northeast region of Nigeria, have involved the kidnapping and murder of journalists and children—boys as well as girls—and several videotaped beheadings of self-identified Christian men and woman who refuse to renounce their religion. Last week the U.S. Senate Committee on Foreign Relations Subcommittee on African Affairs held a hearing to discuss the current state of affairs and the mass kidnapping, which has launched an international movement known by its hashtag #BringBackOurGirls—an effort to draw attention to the plight of the girls, some of whom have reportedly been sold into sexual slavery in neighboring countries. Although France and five African states “declared” war against the extremist sect and the U.S. has pledged to help bring back the girls, Boko Haram continues to apply terror, making many doubt whether the schoolgirls, who have now been missing for more than a month, will be returned safely. Despite a diminishing hope that the girls will be returned to their families—or that the Nigerian government will gain control of Boko Haram—many in Nigeria remain optimistic. Lantana Abdullahi, who testified (pdf) at last week’s Senate hearing, is one of those people. A peace builder, trainer, mediator and women’s activist in northern Nigeria, Abdullahi specializes in interfaith violence prevention and community reconciliation. Through her work as a project manager for Search for Common Ground, she has also worked to bring civil society groups together with the government and security forces to document and prevent human rights abuses in the north-central and northeast regions of Nigeria. Adbullahi has worked extensively with Christian and Muslim teenage girls to raise their voices, reduce the risk of violence and inspire the next generation of Nigerian leadership. The Root spoke with Abdullahi to discuss the psychological impact of the kidnappings on the girls’ communities, what resources are in place for them if they are found and returned home, and how Nigerians remain hopeful, despite what looks like a situation that has spun completely out of control. The Root: You work with young girls in northeast Nigeria all the time. Tell me about your work with them and how this incident has impacted girls. Lantana Abdullahi: We actually started working with young girls that are dealing with the conflict between Muslims and Christians in the middle belt of Nigeria, which has negatively impacted interaction between young people coming up. Because of the nature of the conflict, there are segregated communities based on religion. We find that young people don’t have the opportunity to interact with each other across religious faiths. We have exclusive Muslim communities, exclusive Christian communities, and that means also exclusive schools. While boys can be engaged in the family and community in decision-making processes, girls are often marginalized due to gender discrimination, particularly when it comes to issues of involvement, peace processes and decision-making. Because of this social and religious context, we started a small pilot project to work with young girls from the ages of 11 to 15, trying to bring them together to improve interaction, to learn about one another. For most of them, that was the first time they had the opportunity to interact with girls of other faiths. We trained them on so many things—trauma, resiliency and conflict transformation. At the end of it all, I think what we tried to do was give them a voice that they can hopefully use when they go back to their community to improve their communication, confidence level and so on. TR: What happens when the girls in the program get back to their communities? LA: When they went back to their community, each young girl was paired with a Muslim or Christian to create an activity that they can do in their communities that examines the nature of their various communities. When they returned home, we saw how they were able to raise up their voices to talk to their leaders directly, which of course ordinarily you would have never seen happen. TR: What’s the feeling, the sentiment, like there? Since you know that some of the kidnapped girls have been killed or injured, do people really believe that the girls are going to come home? LA: People are generally optimistic that these girls will come back. The #BringBackOurGirls movement has tried to sustain hope nationwide. We are still seeing rallies going on in many areas, just to keep hope alive. We are very troubled by the video they actually released not too long ago, which featured some of the abducted girls who were actually converted to Islam. This video is raising a lot of dust in the country, particularly from Muslim communities and leaders and even other countries who have acknowledged that it is illegal and un-Islamic to forcefully convert people to Islam. We’ve identified some of the girls in the video, which gives us hope that they are alive, despite the circumstances. TR: Let’s be optimistic and say that the abducted girls do make it back. What resources are in place to help them recover from their trauma and to get acclimated back into society? LA: Our system here is not well prepared to deal with their return. To this day, there have been no measures put in place, which causes us great fear. We want to see nonmilitary support to deal with the post-abduction stage in these areas. We need to think beyond immediate needs, and supporters need to think beyond just military action. TR: What are your specific concerns about the girls once they return? LA: Due to the social and cultural climate, the girls may be discriminated against or stigmatized. They may have been violated sexually, which is a taboo in the context that they come from. We want to start thinking about preparing the communities to accept and integrate these girls back into the society, which for now I don’t see anything happening in that regard. Nsenga K. Burton, Ph.D., is an associate professor at Goucher College and the founder and editor-in-chief of the Burton Wire, a blog dedicated to world news related to the African Diaspora and global culture. Follow her on Twitter.